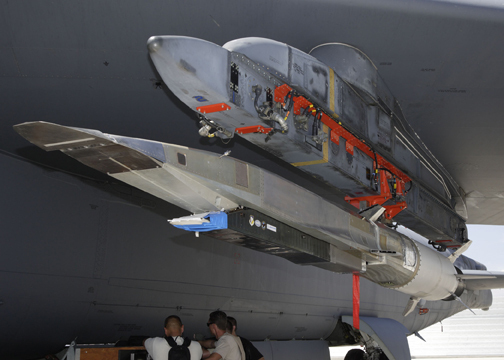 A hypersonic jet known as the ‘X-51A WaveRider’ and co-funded by the US military and NASA will today undergo its latest test; dropping from around 50,000ft before rocketing to speeds of more than 4,000Mph, climbing to 70,000ft, before falling into the Pacific Ocean to break up. Developed and built by aerospace technologies firm Pratt & Whitney Rocketdyne, the WaveRider programme is estimated to cost £89 million ($140 million) according to GlobalSecurity.org and is being funded by both NASA and the Pentagon in the hope it will later be used for military stealth aircraft and, potentially, new weaponry. Utilising what is known as a ‘scramjet’ or ‘Supersonic Combustion Ramjet’ (quite the mouthful), the X-51A pulls oxygen it needs for combustion from the atmosphere surrounding the plane rather than from an on-board source. The result is immense thrust and the ability to travel at speeds reaching five times the speed of sound. During the test, the X-51A will be flown from Edwards Air Force Base in the Mojave Desert in California to around 50,000ft above the Pacific Ocean by a B52 bomber, before being dropped and free-falling for around 4 seconds. It is at that point that the hypersonic jet will fire its rocket booster, accelerating the craft to Mach 4.5 (3,425mph) before being jettisoned. Only then will the revolutionary ‘scramjets’ be ignited, pushing the WaveRider to its top flight speed of more than 4,000mph and propelling it to around 70,000ft. The test will last a total of just 300 seconds, before the jets are switched off and the X-51A plummets to the bed of the Pacific Ocean, never to be recovered. Still, this is the longest the craft has ever flown to date and hopes are resting on the test that it will pave the way towards cost-effective hypersonic flights, where trans-atlantic flights such as those between London and New York could be covered in just an hour.